In my architectural education and experience, there was a minimal amount of management training on the way to running a firm. You have to observe and gradually learn these skills on the job. But there is nothing that prepares you for being the parent of a special needs child. You are given a child with a unique set of challenges that mainstream parenting is not set up to address, and have to navigate a world that is only partially prepared to accommodate the thousands of variations in their makeup. As I look back and compare fourteen years of parenting with five years as the CEO of DiMella Shaffer, I was struck by how the lessons taught by the first experience also applied to the second. I was recently in a seminar about being a better leader and a key part of it was becoming a better person. Adopting my daughter has definitely made me a better person in many ways. Working through the world of her disabilities has exposed me to some of the most amazing people on the planet. I have learned something from each one of them—advocates for the special needs kids, coaches who work with the kids in adaptive sports, high school hockey players who teach kids to skate (not realizing that it took three weeks of coming to just be able to get the skates on, much less get out on the ice), and the adaptive ski instructors, who pick the kids up after they fall down multiple times a session and keep coming to teach week after week while seeing only small progress. There are the parents of other special kids, who see only their potential and not their limitations. Likewise, there are adults that don’t have their own kids, who spend time with my daughter to enrich her life and expand her world. Experiencing this world and being humbled by the amazing work of others only inspires you to try to be better each day. One day out of the blue, my younger sister who is the conscience of our family told me, “Having Annika has made you a better person.” It was gratifying to hear from someone, who would just as quickly tell me if I was out of line, that I had made some notable progress along this path. Wow! You have to learn this one quickly. I am the fourth in line of a family of high achieving siblings. Following in their academic and sports footsteps, I would frequently hear the teachers and coaches say, “So you are Bill’s brother, or Ann’s brother, and you realize he was the team leader, or that she was one of my best students.” It sets you up for striving to meet the high expectations of a family who produced both a governor of a southern state and President Kennedy’s Secretary of Commerce. Excellence is just expected. You learn to apply yourself and set goals and then you meet this little girl and everything comes more slowly and with incredible effort—learning to talk, learning to read, learning to ride a bike, skate, run and ski. Achievements take second place to accomplishments—we made it through the school day, she sat through the movie, or at least today she kept the skates on for 10 minutes. So I gained patience in spades, eventually not expecting everyone to perform things the same way and at my speed. It does not mean throwing away standards, but being open to allowing things to be accomplished in a way and a pace that is different than yours. One day I came home from work and my daughter told me that she had taken my credit card and ordered a math school program on the internet the night before. She was just a beginning reader and for her to be able to understand how to enter all the data to order something would be an extraordinary accomplishment. However the subscription cost over one hundred dollars. I explained to her that we wanted to review the program and make sure it was right for her before agreeing to spend the money. She said that I should cancel it so I called the company and spoke to the representative and explained that I didn’t know whether to be proud or extremely angry. Accomplishing such a task would imply gaining some important skills and an ability to read, but getting my card without permission was not acceptable behavior. The representative explained that Annika got very close twice, but mis-entered some of the information because she couldn’t understand what some of the entries required, so there was no charge. While no real damage occurred, she showed initiative and the ability to figure some things out. As we moved forward I learned to celebrate small milestones because that is mostly all we have. In our work, we need to take time to enjoy not just a project finishing, which might take years, but to celebrate with the team the smaller successes along the way. 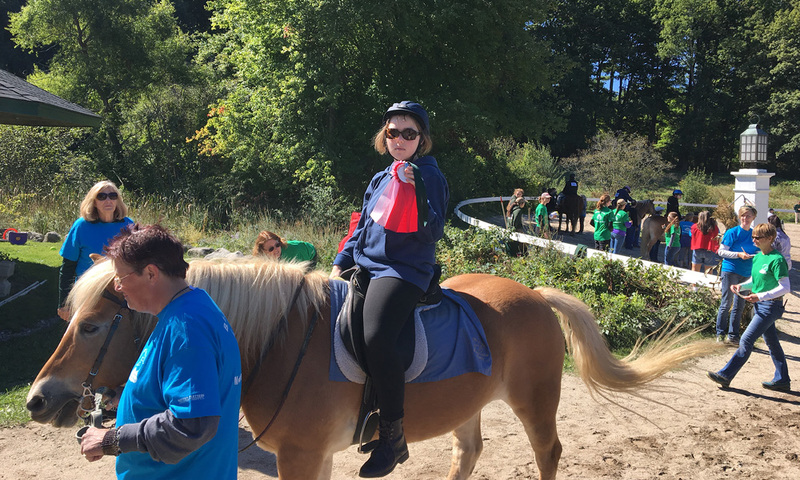 Celebrate the small successes, Therapeutic Riding Ribbons. As I mentioned above, becoming the parent of a special needs kid doesn’t come with an instruction manual. When it comes to parenting, you go with what your parents did or what you learned with you first kid(s) and then you realize it doesn’t work. Special needs children don’t always understand absolutes, their reasoning skills may be compromised, and behavior may get in the way. When our daughter was about eight her psychiatrist said, “You have to pick your battles.” The ensuing 30-minute tantrum after refusing to eat her broccoli just isn’t worth bruising the family tissue, especially since I would throw a tantrum if I had to eat Brussels Sprouts. If it’s not critical or material to the task at hand, I am learning to accept deviations in the way much of our work gets done, as long as nothing critical gets lost along the way. I will never forget the first time I came home from the office and my daughter said, “Dad, you are not the boss. Agatha is.” I recognized right away that there was truth in her statement. From her perspective, Agatha, our accounting manager, is able to make things happen for her when she visits the office. She finds her a desk to sit at, gives her some work to do and a computer to use, and then takes her out to lunch with the girls. Subsequently, when I was preparing for an out-of-town trip, she would ask if Agatha had appointed someone to replace me while I was away, and if not, she had some suggestions of who would be appropriate. Often they were people like Agatha who readily show responsibility in the company and keep its best interest at the forefront of what they do. How does she pick them? I think it is because these people choose to engage with her when she is in the office. The management consultants say that real power comes from giving it away, and Annika reminds me to do that. And even if I don’t, she is happy to do it for me. I was at a bed and breakfast recently run by the former counselor at a vocational high school in upstate New York. He related over breakfast how difficult it was these days to discuss with a parent the fact that maybe their kid should not go to college. They don’t want to hear it. It has been driven into our heads that this is the path of success. I understand this because I was told not so long ago that my child should not go to college and that her greatest academic achievements might be behind her. Talk about a kick in the stomach. We were encouraged to focus on vocational training and opportunities. I suddenly began noticing all the jobs that make the world go round. People don’t tend to call them careers, but if the trash doesn’t get picked up, the world goes to hell in a hurry. We began to focus on what Annika brings to the world, rather than what the world has for her. She likes talking to animals. She is an incessant planner. She comes into her own when helping a more challenged friend or schoolmate accomplish a task. She could work in a dog walking business or pet spa, assist an event planner, or be an aide. Likewise, not everyone should be or want to be the CEO; our world needs all kinds of skills to keep things running smoothly. As an architect, I can see the shortage of people going into the trades because of the emphasis on college, which with its rising costs is calling attention to its return on investment for various career choices. I recently came across a “new” management theory where companies should focus on growing employees’ strengths instead of trying to shore up their weaknesses. This is so obvious with special needs kids, but it takes a university professor’s theory to bring it into the business world. 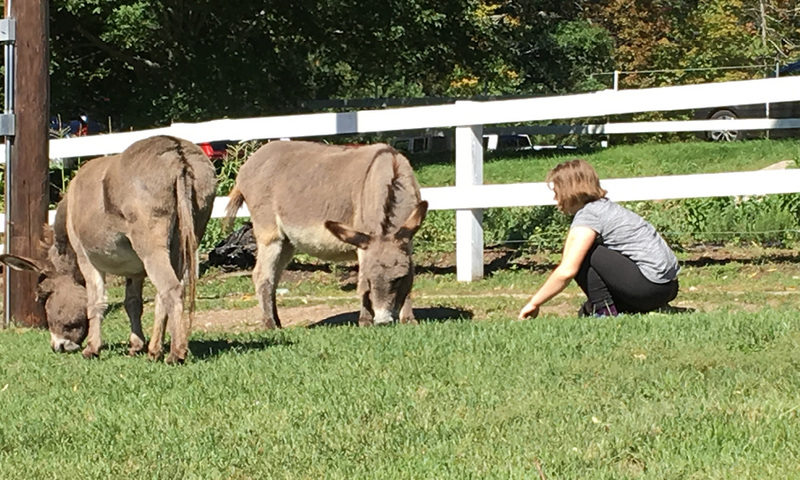 Annika talking with the animals. Recently I had a friend who passed away unexpectedly and his son was to speak at the memorial service. As he approached the podium, he crumpled up his prepared remarks, which scared his mother to death. And then he said that “gratitude” had been his sense of the last few days. I imagine that his mom’s fear turned immediately into pride. Can you imagine having just lost your father unexpectedly and coming up with a word to describe the situation as “gratitude?” He said he watched his grandparents thank everyone who came to the wake and even the wait staff at the restaurant they went to afterward. He recalled friends of his dad who thanked him for sharing him with world. He was thankful for the time he had with his dad and what he had learned from him in that time. It reminded me to think of the primary challenge in my life, parenting a special needs child, and to approach it with gratitude–to be grateful for the experience of adopting my daughter as the person she is. To be grateful for the fact that she has made me a better parent and person. To be grateful for the new experiences and people that we meet along the way. To not wallow in self-pity for my situation, but to be grateful because every day, we see others who face even greater challenges. So remember to stop and thank your co-workers and colleagues for a job well done or for some stress they took off of your shoulders or for making you laugh. Maybe they brought in food or took care of something without being asked. You will be amazed at the number of opportunities you have to express gratitude when you put a little focus on it. 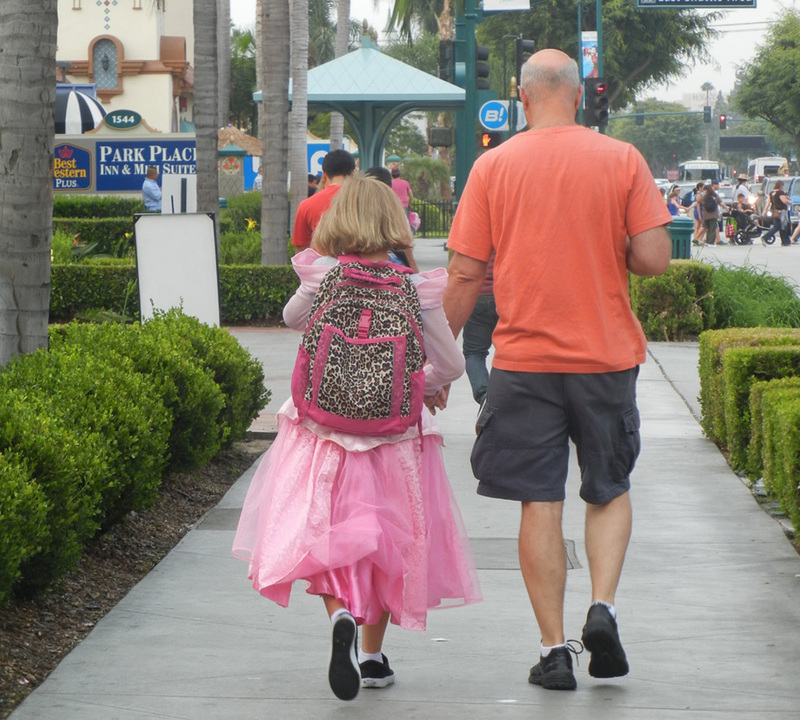 Walking with my princess after her appointment at Disney’s Bebop Beauty Shop. I made it till the end, but now I’m a mess! You are the best dad ever! DiMella Shaffer is in great hands! This was an inspiring piece on many fronts. Thank you for sharing! Well done and well said Ed. My daughter started volunteering with a special needs soccer program 11 years ago at age 10, stopping only because she went off to college. It has had a profound effect on her life. Her college entry essay was about what she learned from those kids and not what they learned from her. She still has relationships with them, and everything she has said about the experience echos your own personal experience. It is truly amazing how a “special needs” child brings out what is “special” in us all. Just give them, and yourself the chance. Thank you for sharing. Your journey teaches me a lot. I have two teenagers with disabilities, I love them so much and I believe they are the best role model and teacher for me. Because nobody is perfect! Thanks Seamus. You captured what I hear when I thank the people who work with Annika. Thanks so much for sharing your story. I have a 24 year old daughter (apparently with even more intense special needs than your daughter) from whom I have learned so much – like you have. After reading your perspective I can reflect now that I have somewhat been applying what she has taught me as I manage the office of a design firm. I have been striving to balance caring for the staff with the business and design aspects of management – to place emphasis where it is most needed in our world – while not often succeeding. I have not always seen the value in this because Achievement is regarded so much more highly in business than interpersonal care and love. Thanks for your reminders. I am inspired to try harder, to maintain the focus: Love. Ed: Thanks for sharing your amazing insightful blog. I am truly grateful for the opportunity to hear your thoughts so well illustrated in your writing about your experience as a Dad of a special needs child as well as a leader of DiMella Shaffer. Your many profound statements and appreciation of others that have helped you with this journey are so wonderful to hear. Practicing patience and understanding how we all learn differently as well as the effort involved has been my greatest gain with raising my son with special needs. We all need to celebrate the differences more. Your daughter is very fortunate to have such a great Dad and DiMella Shaffer is very fortunate to have you as their leader! Thank you again for your inspiration and insight! !